Coco nut oil is as unique a food as it is beautifying to our health. 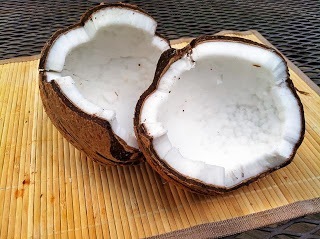 The saturated fatty acids or saturated fats, in coconut oil were for a long time thought to contribute to heart disease and fat deposits in our arteries. Recent studies have proven this to be untrue. Studies have shown that total and LDL (bad cholesterol) levels of cholesterol are actually reduced while the levels of HDL (good cholesterol) are increased resulting in a lower risk for heart disease. Other important health benefits we get from the saturated fatty acids in coconuts (accounting for 90% of the total fatty acids) are weight-loss and curative properties for certain brain disorders. The fats in coconut oil are special because they are MCTs (Medium Chain Triglycerides) so they require more energy to burn in our body than the longer fat chains. Some of this metabolic enhancement is also utilized when some of the fat is sent directly to the liver from the digestive tract for immediate energy use. There it may be converted to a ketone which helps in reducing the risk for epilepsy (seizures) and alzheimers. It is a natural appetite suppressant which is wonderful for keeping your heart healthy and your skin looking younger longer. One of the most interesting medicinal uses for coconut oil is that it helps kill off pathogens such as fungi, viruses and bacteria. The lauric acid (contained in 50% of fatty acids) in coconut oil turns into monolaurin (a monoglyceride); both help in killing the previously mentioned pathogens and keep our bodies away from harmful organisms. For the hair and skin, topical application of coconut oil is great for refining our appearance. Not only is coconut oil a natural sunscreen, blocking about 20% of UV rays. It also helps the skin retain moisture and lipids. When applied to the hair, the oil protects hair from damage by strengthening it; maybe even protected it from falling out.